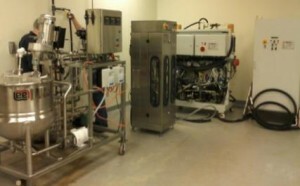 The High Pressure ISO-Lab Processing System is a sophisticated pilot level commercial processing system. The Stansted system has a processing capacity of up to 5L of packaged product, can operate at pressures up to 700MPa (101,500psi), and temperatures from -20 to 120°C. The system is capable of processing both pasteurized and sterilized products (liquids and solids). High Pressure Homogenizer is the latest technology that involves forcing the pressurized liquid through a small orifice in the homogenization chamber causing a reduction in particle size and forming a more homogenized solution. In the homogenization chamber, the liquid encounters mechanical forces (shear, turbulence and cavitation) that results in a temperature increase. This machine pumps about 90L fluid per hour with pressure up to 300 MPa. Mini high pressure tester for conducting kinetics studies on destruction of bacteria, enzymes, and other food quality attributes under controlled pressure-thermal conditions. 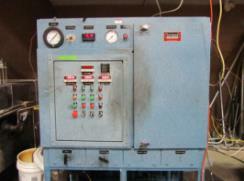 The unit can be operated up to 100,000 psi and temperatures from 5°-130°C. Sample size is about 10 mL. 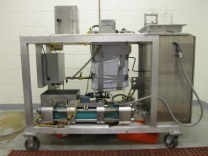 This equipment is a unique tool for estimating properties of food and biological materials under pressure.